The youthXchange guide, since its first production in 2002 has been produced in 17 languages, while in 2008 its second amended and updated edition was compiled, which mirrors the structure of the first one, including new entries and modifications. The translation and adaptation of this second edition of the YOUTHXCHANGE guide in Greek language was undertaken by MIO-ECSDE and MEdIES, and the resulting material is an appealing kit that can be used by Greek and Cypriot ESD educators and addresses the critical issues of importance to young people, like: (i) consumption, sustainable consumption and sustainable lifestyles, (ii) means of transport, CO2 emissions, mass tourism and sustainable holidays, (iii)sustainable fashion & smart shopping that avoids products that have been produced based on child labour, gender inequalities, cruel working conditions, animal testing and or pose a threat to Biodiversity and endangered species, (v) the more or less standard issues of energy and water consumption in daily activities as well as the waste production and ways to minimise it. 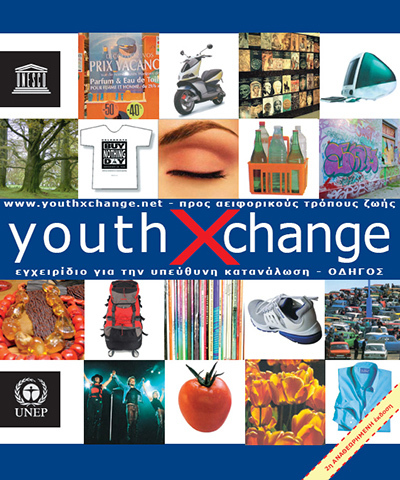 The youthXchange guide is available on www.medies.net in Greek.